Today my nine-year-old son sits in for me as my guest blogger. He wanted to tell one of his favorite funny stories. This is one of my favorite funny experiences with my family. It was my birthday. 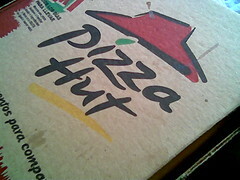 After we opened the presents at home, my cousin, my grandmother, my sister, and my dad, went to Pizza Hut. We had all these leftovers. There was so many of them. The manager wanted to save money. So instead of giving us one or two big boxes, the waitress gave us a bunch of little boxes. We thought it was funny because you could only put one or two pieces in each box. When the waitress came back, she could see we were having trouble. So we asked her again if we could get a big box instead of having to use about 10 little boxes. So she went and talked to the manager. Then she came back, and told us she was sorry, but she wasn’t allowed to give us one of the big boxes. We thought this was so funny. So we started putting slices of pizza in the little boxes. Finally, we were saved. But we thought it was funny that he didn’t just give us two big boxes to start with. Hey there, basically turned into mindful of your site via Yahoo, determined that it is genuinely insightful. I’m just planning to look for the city. I most certainly will value in the event you keep on the following from now on. Lots of other folks is going to be took advantage of your writing. Many thanks! Here it seems the manager and waitress not understand each other.